This morning, a ruling from the Sixth Circuit Court of Appeals represents a partial victory in the case of Rasmea Odeh, the legendary Palestinian American icon who was convicted of a politically motivated immigration charge in 2014, and sentenced to 18 months in prison and deportation last year. Organizers with the Rasmea Defense Committee, which represents over 50 institutions across the country, have been waiting for a decision in the appeal since last October, and are pleased with the result. "This isn't a full victory yet, of course," said Nesreen Hasan of the committee's headquarters in Chicago, "but it really is what we were hoping for and anticipating at this stage. The conviction wasn't overturned altogether, but at least Judge Drain will be forced to rethink his decision on the torture evidence." The appeals court determined that Gershwin Drain, the trial judge who sentenced Rasmea, wrongfully barred expert torture witness, Dr. Mary Fabri, from testifying at the trial. According to lead attorney Michael Deutsch, "The case will be remanded [back to Drain] for a determination as to the admissibility of the expert testimony. The appellate court has essentially ruled that it was an error for Drain to have precluded that testimony." We are hopeful that Rasmea's full story will be told, and that she will ultimately be exonerated of all charges. A more full press release will follow shortly, but contact spokesperson Hatem Abudayyeh for comment or for access to Deutsch. And continue to donate to support the defense work! After several months of deliberation and community input, today the Socially Responsible Investment (SRI) committee voted unanimously to recommend that the City of Portland divest of their holdings in Wells Fargo & Company due to the company’s financing of for-profit incarceration, and their “morally bankrupt” lending practices. This decision marks the first time that a public body has voted for divestment from Wells Fargo due to their complicity in the prison industry. This comes on the heels of recent prison divestment by Columbia University and the University of California, and pledges by Presidential candidates Hillary Clinton and Senator Bernie Sanders to outlaw private incarceration. Jeff Halper is an Israeli peace and human rights activist, co-founder of Israeli Committee Against House Demolitions, Nobel Peace Prize nominee (2006), author and lecturer. Event is Free—donations accepted. Jeff Halper’s new book will be for sale. Did you know that Airbnb, the online accommodation service, is listing homes in illegal Israeli settlements for people to rent? There are 13,000 Airbnb listings in Israel, but investigations have proven that many of the properties are actually located in settlements built on stolen Palestinian land in the West Bank. Sign the joint petition from USPCN, American Muslims for Palestine, CODEPINK: Women for Peace, Jewish Voice for Peace, and US Campaign to End the Israeli Occupation--demand that Airbnb Say No to Stolen Homes! This campaign is especially timely following the recent release of a Human Rights Watch report that called on businesses to comply with their human rights responsibilities by discontinuing to operate in, finance, service, or trade with Israeli settlements. By allowing users to list and rent these properties and taking 9-15% from hosts and guests, Airbnb is profiting off of Israel’s colonization and continued military occupation of Palestinian land, and supporting settlement activity. 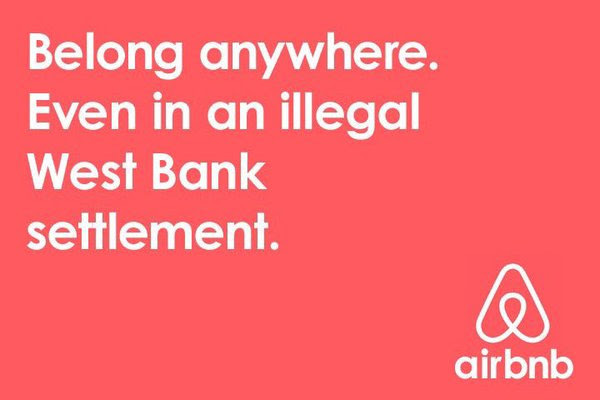 Please take action, and demand that Airbnb end its complicity in Israel's colonization of Palestinian land! Op-Ed on Washington Post: We are lifelong Zionists. Here’s why we’ve chosen to boycott Israel.